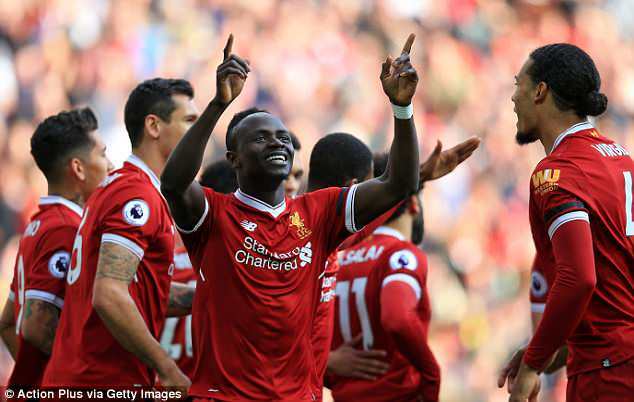 Liverpool’s current form will have brought plenty of joy to Jurgen Klopp’s ranks, yet Sadio Mane revealed it was staying ‘angry’ which helped them beat Bournemouth. The Reds avoided a case of ‘after the Lord Mayor’s show’ by following up their progression to the Champions League semi-finals earlier in the week with a 3-0 victory over the Cherries at Anfield. Any sense Liverpool would be distracted by the looming continental clashes with Roma was banished by Mane’s early goal, with Mohamed Salah then netting his 40th of the campaign and Roberto Firmino’s late strike ensuring Klopp’s side remain on course for a top-four finish. Liverpool had beaten Manchester City at the Etihad Stadium only four days earlier, though Klopp made just one change to his starting line-up as he looked to maintain his side’s momentum. ‘Before the game (Klopp) said we have to (show) our quality and be angry because every game is important,’ Mane told Liverpoolfc.com. ‘After the City game, you have to concentrate more because you usually know how it (can go). ‘He tried to motivate us like usually and in the end everybody was in the right place at the right time to win every ball. The Egpytian’s 30th Premier League goal of the season, which put him five ahead of nearest challenger Harry Kane in the golden boot race, was not a trademark Salah strike. ‘The finish from Mo was a bit of an unusual one for him and one that maybe took everyone by surprise,’ midfielder Alex Oxlade-Chamberlain added. ‘It proves that he can do that. I think I can remember him scoring one away at Leicester earlier in the season and that surprised me at the back post, seeing the little man get up and score a header. ‘(Saturday’s) finish was up there with some of the very best headers of a ball in the world. It was a great finish.